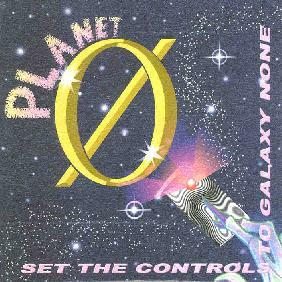 Planet 0 - "Set The Controls For Planet None"
Imagine if you will. A being from New Jersey lands his craft in Memphis, Tennessee. Like-minded mutants reside there and together they create dark, droning, jamming space rock with bits of psychedelia and hints of jazz. Planet 0 is yet another project from Mental Anguish and Nomuzic, this time in full band mode. Chris Phinney and Carl Howard on synthesizers are joined by Roger Moneymaker on guitars, Robert Hinson on bass, and Richard McCracken on drums for a voyage into some of the galaxy's coldest and darkest realms. There may be a story here. We start with "Mothership Departure, encounter star dusters, meteorites, and comets, and the end with "Mothership Return". "Mothership Departure" sets the tone for the set with a deep droning bass and steady drumming while the guitar kicks out slow, whining, and equally droning licks. Around this the synthesizer duo creates droning, fuzzed, freaky space textures and sounds that construct the eerie cosmic landscape against which the rock trio jams. The atmosphere is intense and this would be great music for a sci fi/horror flick. If Argento did sci fi then Planet 0 would be a spot on choice for the soundtrack. "Star Cluster Dusters" features sustained, echoed guitar notes that work well in contrast to the rapidly dancing patterned synths. The valium-paced droning rock jam combined with the wired up bug-eyed synths is pretty damn freaky. A good track. On "Fragrance Of Meteorite", Hinson's bass takes the lead playing a melody so low and thudding he could be drafted into a stoner band if he happened to pick up the pace a bit. Finally, "Mothership Return" opens with spaced out synths, and a brain-splitting pulsating drone. If this is the mothership's return than she must be running the hardest part of course because even in its first minutes these are the most cosmic sounds on the disc. Totally spaced atmospherics and slow freaked out psychedelic guitar jamming make this the bleary eyed epic of Planet 0's journey. In summary, Planet 0 don't vary a whole lot, but taken as a whole this is a thoroughly enjoyable space jam disc. Don't expect feel good music. This stuff is dark dark DARK. Kind of like Chrome overdosed on Valium. So get a stern look on your mug, prepare your suit and breathing apparatus, and climb aboard. It's a fun ride. You can hear tracks from Planet 0 at their Mp3.com web site.